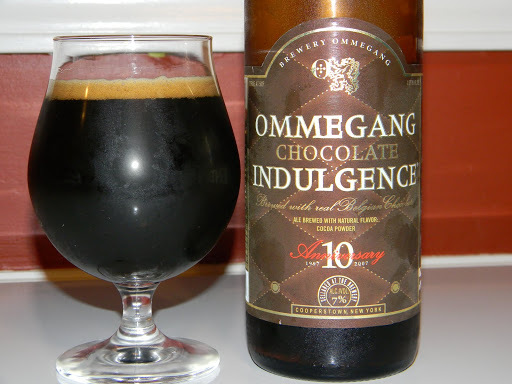 Review of Ommegang Chocolate Indulgence 10th Anniversary | Beer Apprentice - Craft Beer News, Reviews, Interviews and Info. ← Review of Schneider Weisse Hefe-Weizen "The Original"
Tonight I’m going to share with you my experience of the Ommegang Chocolate Indulgence 10th Anniversary brewed by the Brewery Ommegang located in Cooperstown, New York. From the website, ommegang.com, I found a ton of information on the beer, but I’m only going to share a small snippet. Chocolate Indulgence comes with a thick tan head of foam resting on top of the rich onyx-colored liquid. The aroma immediately speaks of dark chocolate and dark malts. The gentle herbal nose of Perle hops compliments the darker notes, making the beer savory to the senses. My mouth is watering already!!! A 25.4 oz. bottle at 7.0% ABV. Pours a very, very dark brown color with no highlights showing through. It had a creamy, smooth, tight, khaki colored head with real good retention and some real nice lacing. After a few moments, it settled to an enticing film across the top. The nose brought out a well balanced sweet chocolate with “whole” milk tones and some minor hints of smoke. Some light cocoa powder that smelled a bit chalky mixed with a toasty Belgian grain. The flavor had a savory chocolate taste with mild touches of bitterness. A few hints of ground, roasted coffee bean. Again, a slight, dry, chalky texture. The chocolate is not a crazy “chocolate bomb”, but rather mild, even, pleasant and very well balanced. Like the aroma, the toasted grain makes a prevalent statement, but does nothing to take away from the chocolate, rather only compliments it to add a wonderful complexity. A nice medium mouthfeel that was dry and smooth. Not quite as creamy as I thought it might be, but still delectable and enjoyable. Covers the palate in a fine way and reveals only a small, minute touch of warmth. The Ommegang Chocolate Indulgence is a super easy drink. Easily an “all night-er.” Easy going, tasty, beautiful and well put together. No doubt about it, one that I would gladly pick up again. I’ll tell ya, I love these chocolate beers, and this one really peaked my interest. Very good and very well balanced. If you haven’t tried it, you should definitely pick it up if it’s available in your area. Do you like chocolate beers? Is anyone reading this? If so, please leave a comment, suggestion or criticism. I promise, I won’t get mad if it’s negative.